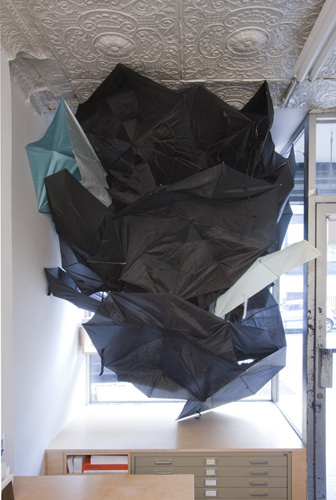 Nanna Debois Buhl and Liz Linden, Stormy Weather, 2008–10, umbrellas, sound, dimensions variable. While the word “dérive” (literally, “drift”) is now frequently used in art writing to describe any randomized stroll, it is worth remembering that Guy Debord advised a more specific aim for such wanderings, namely reversing the dominance of “habitual influences . . . generally categorized as tourism, that popular drug as repugnant as sports or buying on credit.” Similarly pointing to the insidious commodification of free time, mobility, and flexibility, Nanna Debois Buhl and Liz Linden’s SUITCASE WISDOM, 2011, is a wall-based installation of luggage purchased in Chinatown in which the sequencing of knockoff brand names recalls a concrete poem. The nomenclature of aspirational voyaging (BON VOYAGE; ATLANTIC; SEAMAN, it begins) is contrasted with the sweatshop-produced, throwaway products on which it is emblazoned. The sculpture Stormy Weather, 2008–10, offers a more explicit homage to Situationist predecessors; to make the piece, the artists moved through New York’s urban space, allowing their route to be determined by disfigured and discarded umbrellas found along the way. An arrangement of these once useful objects now completely devoid of value is paired with auditory excerpts from National Public Radio’s Marketplace Morning Report that describe economic patterns in a naturalized vocabulary of climatological inevitability. The broken parapluies, like the bags to be tossed upon arrival, signal the pileup resulting from the markets’ insatiable appetite for increasingly frenetic cycles of buying, chucking, and then buying again. In this company, Liz Linden’s . . . all my lists, 2011, an entire wall bearing every enumeration the artist has written over the past nine years, adopts a decidedly more somber tone. Here, the list—to-do, shopping, or otherwise—reads less as a self-determined plan of action than as a paper trail of the further blurring of work time and leisure time that Debord once foretold. Although still gesturing toward aleatory possibilities in the present, every movement and utterance in the show is cinched within a strictly circumscribed system.